Book eliminates the aesthetic encumbrance of the radiator combining aesthetics and functionality with a clean, simple and linear shape that modern technology allows to obtain minimizing the thickness, without losing the efficiency of the product. The International Forum Design in Munich annually organizes one of the most famous and appreciated design competitions in the world which receives over 5,000 requests from 70 countries every year. 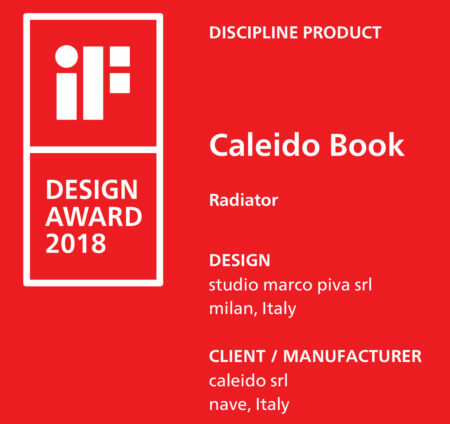 An international jury of 63 experts including design teachers, designers and specialized journalists have tested and evaluated the BOOK design radiator Marco Piva, giving it the iF DESIGN AWARD 2018: a prestigious and important recognition confirming its innovative design. Caleido radiators have always been created and developed as products at the service of the designer. The high degree of customization of the radiators, in addition to the possibility of requesting customized products, allows us to conceive high-level architectural solutions that meet every need. A great honor for Caleido which adds an important international recognition of its products and wins one of the most internationally recognized design awards. Book is currently on display in Hamburg within If Design Exhibition. Until 3 June 2018. Free entrance.